Watch & share what the liberal media won't broadcast. The church, which claims to not actually worship Satan – in spite of providing links to LuciferianApotheca.com, "a trusted GCOL supplier," which sells statues of Baphomet as well as medallions inscribed with “Dei Nostri Satanas Luciferi Exelsi (our god satan lucifer, the exalted one) – has stirred the local people to prayer and protest. Soon after the official announcement of the church's public opening, local Catholics requested the assistance of the TFP and its America Needs Fatima anti-blasphemy network. Answering their call for help, volunteers from around the country showed up to support them. Upon arriving it became clear how serious the situation had become. At about 12:00 noon, 12 volunteers met with some locals to pray across the street from the luciferian temple. With signs in hand, the volunteers prayed a public rosary of reparation. Towards the end of the first rally, several teenagers began to converge. Although they brandished a “coexist” sign, the protesters were not there to dialogue, but to uphold God's honor and glory. “I've never met Catholics like you before,” one observer told a volunteer. Following lunch and a brief break, more TFP volunteers from Louisiana arrived, bringing more signs and a statue of Our Lady of Fatima for the 5:00 PM rally. “We are here to do a peaceful, prayerful and legal protest, as the TFP has done for over 40 years,” said TFP-Louisiana president Thomas Drake to a crowd of over 125, which included many pro-life activists from the region. 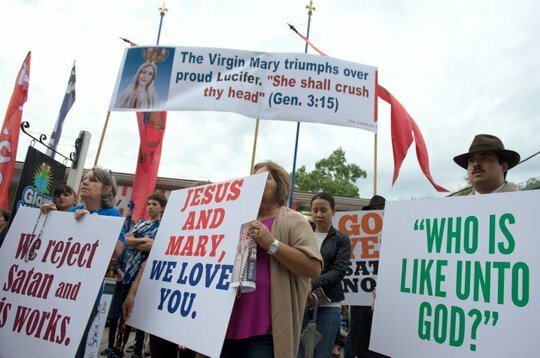 Lining both sides of the street, the mostly Catholic protesters held signs which read “God Yes – Satan No,” “Who is like unto God” and others, as well as banners which read, “We are one nation under God and Satanism is not an American value,” and "The Virgin Mary triumphs over proud Lucifer. 'She shall crush thy head' (Gen. 3:15)." Following the lead of America Needs Fatima and TFP volunteers, the crowd began to pray the Holy Rosary, pausing after each mystery to sing. Regardless of their attempts to disrupt the demonstration, those present paid them little mind and only prayed more fervently than before. The second rally concluded with a kneeling Consecration to Jesus Christ through Mary and a singing procession with the statue of Our Lady of Fatima. The GCOL claims that they should be allowed to have their church in the middle of Old Town Spring, a family-oriented commercial district, on the basis of freedom of religion and coexistence.Many don't agree with this. Let's remember Saint Louis de Montfort's incisive words based on Genesis: "God has only made and formed one enmity; but it is an irreconcilable one, which shall endure and grow even to the end. It is between Mary, His worthy Mother, and the devil -- between the children and servants of the Blessed Virgin, and the children and tools of Lucifer... The humble Mary will always have the victory over that proud spirit, and so great a victory that she will go so far as to crush his head, where his pride dwells.”Viva Cristo Rey!